Smooth and creamy mashed potatoes. Once upon a time, I assumed they were universally loved. That is until I met my potato-loathing husband. (Freak.) Last night, as I slapped these glorious roasted garlic mashed potatoes with rosemary onto my plate—next to my garlicky green beans and surf’n turf—I thought back on the days where I’d dejectedly pass by the potatoes at the market. I’m so glad I eventually decided that hey, I can make mashed potatoes FOR MYSELF. I can’t imagine a comforting holiday meal without a pile of buttery, gravy-soaked mashed potatoes. And with Thanksgiving just around the corner, visions of fluffy gravy volcanos danced in my head. 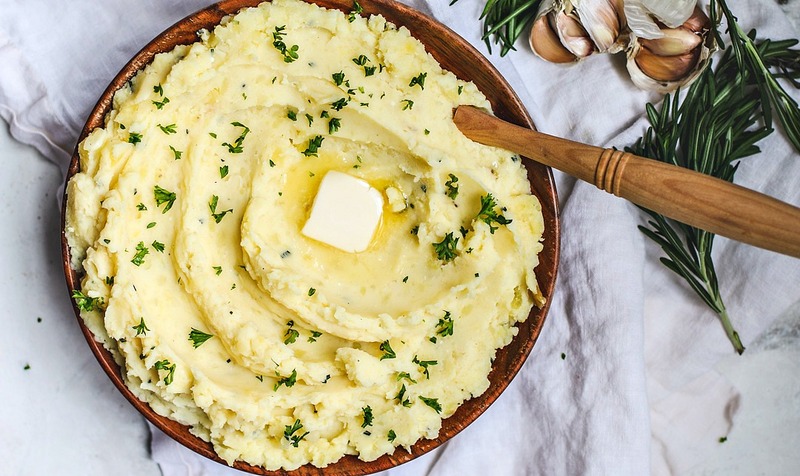 Roasted Garlic Mashed Potatoes With Rosemary. Growing up, mashed potatoes were pretty basic—but deliciously basic. My mum always had a healthy balance of protein, veg, and carbs for our plates. Those carbs were usually in the form of mashed potatoes. She’d smash butter, milk, salt, and pepper into those taters and call it a day. And I don’t blame her. It was quick, easy, and delicious. But after a few meals at bougie steak houses, I’ve grown to fall head over heels for the rich flavor of roasted garlic mashed potatoes. Add to it some warming and herbaceous rosemary, and you have mashed potatoes that taste like they’re meant for the cooler months. For a healthier dose of creaminess, I skip the cream cheese and sour cream and opt for plain Greek yogurt. But you can use any of the three. I always have a tub of plain Greek yogurt on hand for things like this. The texture and tanginess is perfect for mashed potatoes. These creamy Roasted Garlic Mashed Potatoes With Rosemary are full of rich and herbaceous flavors, and they're perfect side for any holiday dinner. You'll want to start roasting the garlic 25 minutes before boiling your potatoes. Heat oven to 375ºF. Peel any extra skin off of the garlic bulb leaving only the last outer later of skin (you want to keep the bulb intact). Place the bulb onto a sheet of tin foil (about the size of a dinner plate), and drizzle a bit of olive oil over it. Bring bring the foil together over the garlic bulb to create a tent. Pinch a few edges to secure the tent, and bake for 40 minutes or until the garlic cloves are golden brown and nicely roasted. (Check on it at 25-30 minutes.) When done, remove the bulb from the oven and set aside to cool. Place your peeled and quartered potatoes into a large pot and cover them with cold water. Add a pinch of salt. Place the pot over medium-high heat and bring the potatoes to a boil. Once boiling, bring the heat down to medium-low, cover, and simmer for 15-20 minutes or until the potatoes are fork tender. When the potatoes are ready, drain them, and place them over medium-low heat. Let them sizzle for a few moments to remove any excess moisture. Then, remove from heat. In a separate saucepan, melt 3 TBSP of butter. Add the chopped rosemary, bring the butter to a low simmer, and whisk for about 30-40 seconds to let the rosemary soften up and infuse the butter with some flavor. Remove from heat. Squeeze all of the roasted garlic from their bulb into the pot with the potatoes. Then add the salt, pepper, rosemary butter, half and half, and Greek yogurt. Mash with a potato masher until you get the consistency that you desire. Add extra splashes of half and half or some extra Greek yogurt as needed. Transfer the mashed potatoes to a serving dish, top with fresh chopped parsley or chives, and a few knobs of butter for extra buttery goodness. If you have a food mill, you can run your potatoes through it to get the creamiest consistency. After running your potatoes through the food mill, you can then add the rest of the ingredients for mixing. Oh my goodness roasted garlic makes everything better!! This looks perfectly creamy and rich! Can’t wait to try this for myself! Ummm I am salivating over here! I make garlic mashed potatoes all the time, but this version just kicks it up a notch, and it's a notch I am liking very much. I love the additional step of roasting the garlic, I can imagine it adds so much more flavor!! My hubby also won't eat potatoes, not because he doesn't like them but because he doesn't like to eat carbs - weirdo!! Wait. You married a man that doesn't care for potatoes?! I'm sure he has many other redeeming qualities. ;) I love a good pile of mashed potatoes. Your method of simmering the rosemary in melted butter is brilliant! That has to bring out so much flavor. When it comes to mashing, I skip the food mill simply to avoid doing more dishes. I can't believe that there is a man out there who doesn't like potatoes. It's usually meat and potatoes and forget the veggies. Your roasted garlic mashed potatoes look amazing. Love the addition of the rosemary. That herb is one of our very favorites. You are so right to add the rosemary to the butter. In my attempts to make a more gourmet mashed potatoes, I usually end up throwing something in willy-nilly and the flavor of the rosemary is always too harsh. This little step makes a huge impact without any extra effort. Hey, I married a freak too! More taters for us I guess. At first I avoided them because I thought it was silly to cook potatoes just for me but then later I decided I deserve mashed potatoes even if I'm the only one eating it. I have never tried rosemary before but I am game. I love the stuff, used to grow it in my garden in Texas where it balloons into 3 foot hedges. Thanks for this recipe! Perfect comfort food! Garlic + rosemary + potatoes are a match made in heave! I am drooling over these potatoes! I'm starting to think I should celebrate both Canadian and American Thanksgiving so I can eat all the mash potatoes. I mean, who hates potatoes?! I'll gladly take all the potatoes that is not wanted in your household that your husband doesn't want haha. These look delightful and super creamy! How can your husband not give in and give up to such potato goodness? Well, I'm super glad you treat yourself to this incredible dish. I've been looking for a new mashed potato recipe to try out and this one is going to be it. Your husband LOATHES POTATOES? Heathen! I would not give up the spud for anyone -- glad you've taken back your potato-love. The roasted garlic and rosemary sounds like a heavenly combo to me and they'll go great with our Tom Turkey. I'm buying extra garlic and herbs today, just so I can do this. Perfection. I am a total potato fanatic. These would be perfect for the holiday dinner table. You can never go wrong with delicious mashed potatoes as a side to any meal. The garlic takes this recipe over the top. YUM!! Those potatoes look so beautiful and creamy! That roasted garlic must make the house smell divine as well as the potatoes taste amazing. Love the rosemary flavor too.